We at Open Brunei reflected on our experiences of the metro services in Singapore, London and at major cities around the world, and wondered what a metro service would look like in Brunei. Where would the stations stop by? How many lines would there be? How would it all fit together? 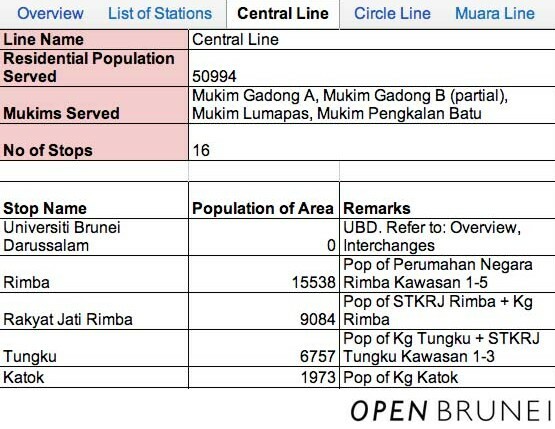 And so, after much messing around, using the data available to us, we propose to you – drumroll, please – a metro service for the Brunei-Muara district. Shortest Route: Circle Line covering the distance of 10 miles. The routes and interchanges pinned on Google Maps. This is not a “real” proposal. Not at all. Consider this a fun exercise in creating a graphic of what a route map of a metro service in Brunei would look like if it existed. The use of real data is a plus, as it helps us, and you, to understand that it is not easy to construct a transportation system that caters to the public. For more on this, see our Appendix “Development of Routes”. We have no connections to this website or this image that has been distributed on Whatsapp. They both propose similar concepts and by no means do we think we have come up with a unique idea. This is not a “real” proposal. It has not been submitted to any of the relevant authorities. We have no formal connections to the BSB Masterplan, the Land Transport Department, transportation committees or other related organisations. There are seven interchange stations: Bandar Seri Begawan, Brunei International Airport, Gadong, Kiulap, Sengkurong A, Serusop, and Universiti Brunei Darussalam. They are concentrated in areas where people are likely to change stations for work or school. Initially the Central line was made up of two lines connected at Bandar Seri Begawan station, one catering to Mukim Gadong A and B, and the other to Mukim Lumapas and Mukim Pengkalan Batu. After some thought it made more sense to create a Central line, to connect them both. The Circle line was created to service some of the major government buildings, from the Old Airport Area station and the Jalan Menteri Besar station. During sporting occasions or marathon events, the National Stadium station can be used to ease congestion. The train used for this line will be running far more regularly in comparison to the other lines. The Muara line is probably the most scenic of the routes and was the first one we created. Going along the Brunei River, it’s also a line that could appeal to tourists, going through The Brunei Museum, the Pantai Menteri Golf Club and the Beaches along the Muara area. Primarily this line serves students of Universiti Brunei Darussalam and Institut Teknologi Brunei, but it’s also a convenient route for those staying at the Empire Hotel and Country Club. The North Western line is split into two, according to the initial census Lambak Kanan has one of the highest residential population and splitting the line will ease congestion during peak hours. This line stretches to Kupang in Tutong, and from there, people will be serviced by a different transport system for the Tutong district. The main areas serviced by this line are Mukim Sengkurong and Mukim Kilanas. If we consider the various kampongs that are served by the line, and residential populations of each, we can see the potential numbers of people served by each line and station. The numbers have been compiled into this spreadsheet. and other stats, as only non-statisticians could create. The figures did not heavily influence the choice of stations. For more on this, view our Appendix “Development of Routes”. Google Maps: Our main reference for the location of places and the sequence of the stops. Names of places and their locations relative to each other, were based on the data in Google Maps, and only a few amendments were made. For example, Google Maps listed a “Kg Paring”, which does not exist. We apologise for any further inaccuracies. JPKE’s Preliminary Report of the Population and Housing Census 2011: A major reference for the “Populations” spreadsheet. In particular, the populations of villages, and the mukims they were situated in, can be found in Appendices A1, A2.1, A3.1-A3.18. We realised, at the time of posting, that JPKE had just released the 2011 Brunei Darussalam Statistical Yearbook, however we did not use any of the population data from this publication. Brunei-Muara Metro Service: Development of Routes for a more detailed commentary on the figures, and other considerations. We invite you to share your opinions on our Brunei-Muara Metro Service. Again, we are not taking into account the implementation in terms of cost-effectiveness or infrastructure. Yes, those are important, but the purpose of this exercise is to imagine Brunei having an MRT system, and not to entertain cries such as “this a waste of money”. Please view our Appendix “Background” for an overview of concerns with public transport, which can be a starting point, for those of you who do want to think on that level. Do the lines work for you? What would these lines mean for school students, workers, families, and tourists? Which ones would you use most? If there were a metro service in the Belait, Tutong or Temburong district, where would the interchanges be? What would the most popular route be? How would you price the tickets? I just read and found it interesting. It would be better if we could stretch it to all the 4 districts! Price of the tickets, I think $1/km or 50c per stop. I dont know… it all depends on the service provided by the LRT and the cost of constructing the LRT system. 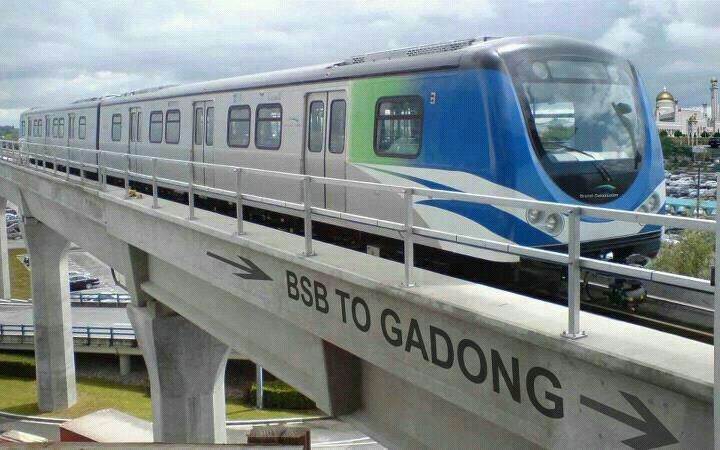 As for me, the important routes would be those which are going to BSB, Gadong, , Qlap, UBD, Berakas and Serusop. The most important one would be Berakas(from where I live) to UBD (where I study). Interesting point about the pricing, do you think $1/km is affordable for many people? Since you mentioned going to alot of places what is the maximum you will be willing to pay per day? As for the other districts, I would imagine the MRT/LRT would generally follow the route of our highway. The obvious ones from Belait would be KB, Seria, Lumut, Sungai Liang and probably Labi as well. As for my home district Tutong…I think the main Lines would be a stop at Pekan Tutong and then an interchange for the ‘Merimbun Line’ that goes south to Tasek Merimbun – good for tourist. The Merimbun Line would have few stops along the way. Another potential stop would be at the Penanjong Garrison but I’m not sure if you can make a stop at a military base. Bukit Beruang? It’s a residential area and there’s the district’s only sixth form school school there – could be a place to put a station maybe? Other places: Keriam? Danau? The express route is an interesting idea from Jerudong, Gadong, The Brunei International Airport and then Muara. Although an express service would be better between the districts. Do you think that Jerudong, Gadong, the aiport and Muara are the places people are most likely to go to? As for Tutong, the population is relatively smaller than in Brunei-Muara so I’m not sure if there is need for too many stations. From what I can understand, the population is mostly concentrated on the northern region of Tutong (ie Basically areas along the main highway/Jalan Tutong). I don’t know about ‘kawasan pendalaman’ to the south because I hardly go there. So if there is a line that goes south to Tasek Merimbun, I’m not sure how many stops would there be along the way and at which relevant kampung that has a population worth making a station for. As for pricing tickets, maybe 10-25 cents per stop? Considering that Brunei’s bus fee is already just $1 to practically anywhere it might be reasonable. And the ability to purchase MRT Cards (like the ones they have in Singapore) could also add to the convenience. As already commented above, it would be great if expanded into other districts. Maybe even having direct routes for people who live in Bandar but work in Belait, etc. Pricing of 10-25 cents per stop seems quite cheap! In comparison for one ride between Orchard and Newton on the Singapore MRT is 73 cents for an adult. What areas do you think could be completely car free? Currently there are few places in the country where you can walk around, such as Bandar or Gadong but it isn’t really relaxing to stroll around those places. I’m glad you guys ditched us to make this. It’s very clean and well done. It made me wonder what the best system is for Brunei in order to have this, whether it is an underground system or overground. Just thinking about the Airport highway made me realise how inconvenient this would be if it is overground because the residential areas are very close to the roads. They’re changing the bus pricing to 30 cents per stop, which is quite expensive if you’re heading from say, Berakas to Bandar, taking note that most users are either blue collar workers or the elderly, which would take a beating to their financials. So, it has to be maybe less than that. We have to consider the variable that Brunei is relatively cheap compared to Singapore, thus the ticket pricing would have to be in line with the standard of living inclusive of fuel price (which is fortunately cheap, therefore working in favour of commuters! ), land and management price. I think 50 cents (minimum) to 1.75 (maximum) in busy areas sounds reasonable and cost becoming progressively less in more sub-urban/rural-esque areas. We should have bullet trains to Belait. Good points on the pricing. In your example, users could be charged more for travelling to busy areas and less for rural areas. Who would you think would be major users of a metro system? Referring to the bus pricing of 30 cents per stop, we assume you’re referring to this: http://www.bt.com.bn/news-national/2012/12/20/bid-make-bus-service-user-friendly It seems like the pricing has not been fixed, so there is still hope that transport officials and bus operators can come up with a pricing model that works in favour for everyone. Anyone along the routes would use them. I’m always okay with walking, but I can see how taxing it is to walk in Brunei especially with the fickle weather, dangerous roads that has no sidewalks and the lack of roofs. Developing a system like this requires improvement elsewhere, inclusive of the things I mentioned and of course, a good bus system! I love busses, guys! This would be easier to the elderly who no longer uses cars, and teenagers in general. I think the problem with transport system is that Bruneians are not used to the idea of it, having used cars since they were born. I’m thinking of the amount of people I know who’d go on holidays overseas and use cabs more than bus or LRT systems. Attitude needs changing! Those are great points, if only we could give a thumbs-up! So, if Bruneians have seen cars as the only way to travel in Brunei, and they need to change their attitudes, what are some good ways to start doing this? There was a race held by Tutong Youth Group just this month that required participants to use buses. What about families, or office workers? Apart from agreeable ticket prices, how could the rest of the population be persuaded into using public transport? I think this is a fantastic move forward for Brunei… but I also think a cross-country service is very much needed. Between KB/TUTONG/BANDAR. Untuk makluman biskita, cadangan ani is “just for fun”, ia bukan akan dihadapkan ke mana-mana pihak berkuasa, tapi niat kami ialah supaya orang ramai dapat merenungkan dan membahaskan topik MRT ani. But still, thanks for your good wishes. We also hope one day to see better public transport in Brunei. If it’s economically viable, then get it done! What are people waiting for? I think it is important also to have a train going from Bandar to KB/Seria. I know so many people who commute from BSB to Seria on a daily basis who would welcome this with open arms. I hope this will be approved in my lifetime! We’d like to point out that this was not a “real” proposal that was submitted to any authorities, and is more of an exercise where we hope to get people thinking. But we do hope that major improvements to public transport will get approved in our lifetimes, as well! Do you think commuters would be willing to switch from their personal cars to using a train or MRT system? What would be the personal pros and cons to the individual? What would it mean to those who have already got temporary homes in the district where they work? You guys really put alot of effort in this. Its pretty well done. I believe the bus system should be improved first though. As there is not that many stops for this MRT/LRT system, i don’t believe many people are willing to walk far distances from their home. With a bus system they can use a bus to go to those stops. I also believe this system wouldn’t be applicable YET but definitely would be in the near future. A proper way to implement this is by starting with the youths. Maybe making it compulsory for students to use the public bus and not allowing them to get sent by cars by their parents. This will ease the parents and teach them to use the public bus as well as teaching them to be more independent. With this they will start to get used to using public transport and the future generation would have no problem using public transportations. One last suggestion would be start with the most populated areas first (Berakas, Lambak, Serusop, Gadong, Qlap) and continue to make more stops the more they are used. Nonetheless a brilliant idea. Good point on making sure that the bus system complements the MRT system, in terms of closeness of stops. Hmm, if people are not willing to walk to the MRT stops, would they be willing to walk to bus stops? Interesting thoughts about youths and students. In your suggestion, would all students be required to use public buses, to all schools? What about younger students under the age of 12? What about existing school buses? What did you think of the race recently held by Tutong Youth Club, where participants were required to travel using public transport? I am very much in favour of a metro service for Brunei, and I definitely agree with your choices of interchange stations. At the current (or near-future) state, I think that the majority of those who would use the metro service would be foreign workers (not the wealthy ones of course); other than these workers it would be the elderly, the very-much-less affluent, as well as tourists, and possibly teenagers too. Yes, I am taking example from users of our current bus system and yes, this also means that I think usage of the metro service depends a lot not just on its own pricing but also on the bus sytem’s pricing. I say “near-future” because just like in the current state, fuel and car prices are really pretty low. I mean, if fuel is cheap, if cars are cheap and if I can get the privilege of having my own transport at relative ease, of course I’d stick to cars, right? If the majority of the population is well-off, then that also means that the majority of the population won’t be relying on any of the public transport system. So that only leaves foreign workers and those perhaps not capable of having their own transport (the elderly, the not-well-to-do, tourists and teenagers). I mean, we can talk about “attitudes” but I think prices and money put equal (if not more) weight on people’s choices. And yes, I do think that the current fuel subsidies are unsustainable and that one day they will unfortunately have to go away, and only by then would people be more inclined (or more like compelled) to take public transport once costs of having our own transportation become too overwhelming. As for the pricing, if the government supports greener alternative, then I think it shouldn’t mind subsidizing metro service tickets (or at least shift subsidies from car fuel) so people would have more financial incentive to go on the metro service. I also agree that busier stations should charge slightly more (but not by too much so as to discourage people from going to these ‘productive’ areas). Perhaps the metro service can implement zones too just like in metro services in other countries? Other than that, I agree that bus services need to work hand in hand with the metro service not just in terms of servicing the ‘less-serviced’ areas but also in terms of prices. And I really think that a lot more pavements and bridges need to be built if we’re really gonna let people walk. I might have said too much hahaha but that is all! Do you think that the well-off majority of the population would not be tempted at all to use public transport at all? Bruneians are already known to car pool when it comes to lunch on working days, or weddings. Could this be taken into account? Great point about more pavements and bridges. Are there any specific areas frequented by pedestrains that you feel aren’t particularly pedestrian-friendly? Sincerely feeling the idea guys, and loving the suggestions made in previous comments. My addition would be a system similar to that of the Octopus card in Hong Kong/Oyster card in London which can be used in both buses and the metro. As mentioned above, there aren’t fixed fares as of date but more regular users (owners of such a card) should be charged less to use public transportation. Perhaps a nation-wide metro is not unfeasible? Like the London Underground, maybe include ‘zones’ for stations in each district? As for Temburong, maybe the metro can extend a line on the actual bridge being built that links Bandar to Bangar – not unlike London Overground. A bit late to reply to this article but here I am nonetheless! I think it’s a good article and seems like quite a bit of thought was put into it, as someone else already commented. In line with the BSB DMP, and as a few above have already commented, it’d be great if we could get improved public transport service (bus or metro) linking the hotspots of Brunei-Muara e.g. Gadong, Kiulap, Airport, Bandar, government offices and then if the response is good, develop the system to link all the villages. I like the idea of air conditioned trams with big windows (I like to people watch as I travel) that we can just jump on and off to get from Gadong to Kiulap for example. But I guess implementing it would require modifying our existing roads or even expanding some roads and I’m not sure this will be easy. You idiots in Brunei can’t even build a road to Temburong and you want to build a metro rail system? Haha don’t make me laugh you lazy jackasses.